(CNN) - Akayed Ullah set off a pipe bomb explosion at a bustling bus terminal near Times Square with the hope of "taking as many innocent people as he could with him," according to a federal prosecutor in Manhattan. "Through incredibly good fortune, his bomb did not seriously injure anyone other than himself," acting US Attorney for the Southern District Joon Kim said Tuesday. Ullah, 27, and five other people were injured Monday. 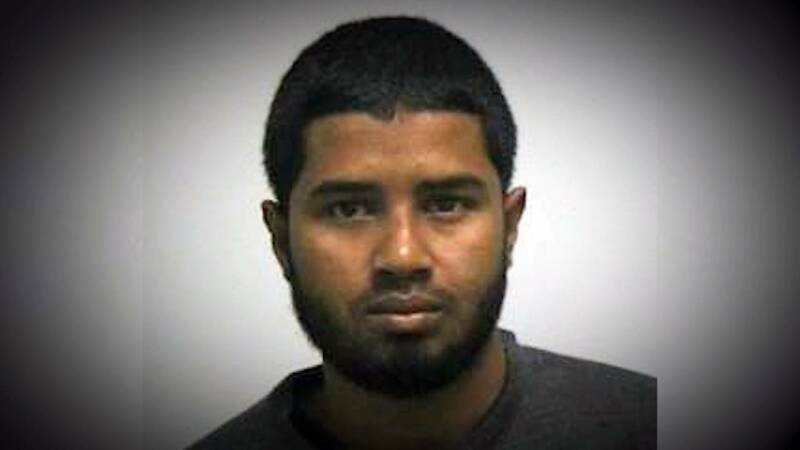 -- Ullah lives in Brooklyn and is of Bangladeshi descent, two law enforcement sources said. -- He arrived in the United States on an F43 family immigrant visa in 2011, DHS spokesman Tyler Houlton said, calling him a "lawful permanent resident from Bangladesh who benefited from extended family chain migration." -- He faces five federal terrorism-related charges and three state terrorism-related charges, according to court documents. -- He had no criminal record in the US before the bombing, according to a preliminary background check. -- Ullah has no criminal record in his native Bangladesh, according to Sahely Ferdous, a Bangladesh police spokeswoman. Ferdous said Ullah last travelled to Bangladesh's capital Dhaka -- where he was born and raised -- in September, but police had no information on why he was there. -- A federal law enforcement source said Ullah's travel overseas was not significant for the alleged planning of this attack. -- Police in Bangladesh have been speaking with Ullah's wife in an effort to learn more about "how he was influenced and how he joined these activities," Ferdous said, adding that authorities went to the wife's residence in the capital Dhaka to question her. -- Ferdous said Ullah and his wife have a 1-year-old child, but she was not sure of the gender and had no information as to whether the wife was living in Dhaka or just visiting. -- He recently did electrical work close to Port Authority with his brother. That brother lives in the same apartment building as Ullah, according to law enforcement. -- Ullah is in custody and is now at Bellevue Hospital, where he is being treated for lacerations and burns to his hands and abdomen. He is said to be seriously injured. -- He did not pray at a mosque, according to a law enforcement source, but prayed at his home in Brooklyn. The source said that several of Ullah's family members are not cooperating with authorities at this time. -- The suspect wore an "improvised low-tech explosive device attached to his body. He intentionally detonated that device," Police Commissioner James O'Neill said. -- The device was a pipe bomb affixed to his person with a combination of Velcro and zip ties, said John Miller, deputy commissioner of intelligence and counter terrorism for the city. -- Investigators confirm the suspect had at least two devices, a law enforcement source with knowledge of the investigation told CNN. The device that detonated was a foot-long pipe and contained black powder, a battery, wiring, nails and screws, the source said. -- The explosive chemical ignited, but the pipe itself did not explode, lessening its impact, Gov. Andrew Cuomo told CNN. -- The suspect made the bomb last week at his apartment in Brooklyn, a law enforcement official with direct knowledge of the investigation told CNN. -- Cuomo said it was an amateur, "effectively low-tech device." -- The suspect was first spotted on a security camera as he began to climb the subway station stairs to the 18th Avenue F. train platform in Brooklyn at 6:25 a.m., according to one law enforcement official with direct knowledge of the investigation. -- He then switched to the A train at Jay St./MetroTech stop in Brooklyn before leaving the train at the Port Authority Bus Terminal stop in Manhattan, the same law enforcement official says. -- Grainy surveillance footage shows commuters walking through a tunnel when a burst of smoke erupts into the hallway, quickly filling it. Commuters flinch and take cover. When the smoke clears, a man can be seen lying on the ground in the hallway. -- Ullah, on his way to carrying out the attack, posted on Facebook, saying, "Trump you failed to protect your nation," according to a criminal complaint. -- Recent Israeli actions in Gaza compelled Ullah to carry out the attack, a law enforcement source said. The suspect was upset, in his words, with the "incursion into Gaza," the source said, but did not elaborate on what incursion he may have been alluding to. Israel launched airstrikes this weekend against what it said were Hamas targets in Gaza after several rockets were fired out of Gaza toward Israel. This came amid widespread protests over President Trump's move to recognize Jerusalem as the capital of Israel. -- In conversations with authorities, Ullah pledged allegiance to ISIS, according to one law enforcement official with direct knowledge of the investigation. -- "I did it for the Islamic State," Ullah told investigators, according to the federal complaint. -- Ullah's ISIS radicalization began in 2014, according to the complaint. -- He began researching how to build improvised explosive devices about a year ago, began collecting the necessary items two to three weeks ago, and built the bomb in his home a week ago, the complaint states. -- A passport in his name with a handwritten message -- "O America, die in your rage" -- was recovered by investigators. -- Ullah told investigators he was motivated in part by pro-ISIS Christmas attack propaganda circulated about a month ago online with an image of Santa Claus over Times Square, a law enforcement source told CNN. -- One of his goals in the attack was to terrorize as many people as possible -- on a workday, the complaint said. -- "Ullah had apparently hoped to die in his own misguided rage, taking as many innocent people as he could with him," Kim told reporters. -- Ullah held a New York City Taxi and Limousine Commission for-hire vehicle driver's license from March 2012 through March 2015, NYC TLC Deputy Commissioner for Public Affairs Allan J. Fromberg said in a statement to CNN. -- That license lapsed and was not renewed in March 2015, Fromberg said. -- Ullah was not licensed to drive a NYC yellow taxi, he said. -- "As taxi and for-hire vehicle drivers are independent contractors and not employees, I have no way of knowing whether he drove for any particular base, or whether he simply got the license but didn't drive at all," Fromberg said. "That said, since he held an FHV license, if in fact he did drive, we do know that it could not have been a yellow taxi." -- Alan Butrico owns a residential building next door to the building where he says Ullah and his family live. -- Butrico said Ullah lives in the basement, his sister on the first floor and his brother on the top floor. -- Neighbors told Butrico they had heard fighting and yelling at Ullah's home during the past two nights. This story has been updated with more information based on a federal criminal complaint against Ullah.